sg2010 brought together a global community of innovators and pioneers in the fields of architecture, design, and engineering for a six remarkable days of design exploration, fabrication, collaborative research and networking in Barcelona 19th – 24th March 2010. Prototyping is an integral part of the design process. Prototypes allow designers to explore alternatives, test theories and confirm the performance of a new design system or product. Working prototypes are the fruit of a dialogue between digital and physical, analogue and virtual as a iterative processes of designing, fabricating, testing, evaluating and progressively refining designs. The workshop challenged participants to design and assemble functioning prototypes to verify the performance of a new design system or product. Design becomes an iterative process of testing and feeding back into the next design cycle. By their very definition, prototypes are at the critical intersection of ideas and material reality. They are the proving ground of design success or failure. In general an iterative series of prototypes will be designed, constructed and tested as the final design emerges and is prepared fro production. Prototypes are generally built for those aspects of a design not yet resolved. With rare exceptions, multiple iterations of prototypes are used to progressively refine designs. A common strategy is to design, test, evaluate and then modify the design based on analysis for the prototype. The conversation around digital models and parametrics fuses with physical thinking, material understanding and construction and assembly practicalities and logistcs. Digital design can finally be liberated from the hard drive as digital fabrication emerges as a site for creativity and resolution. 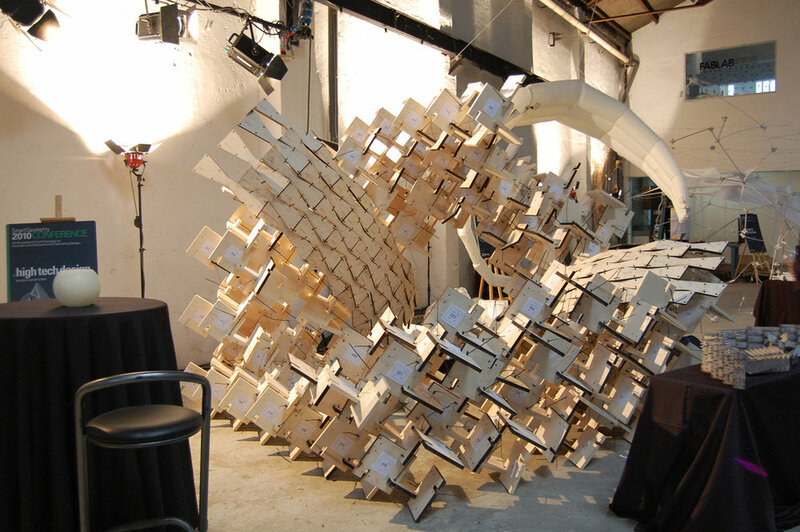 Scripts creating geometry enter a dialogue with code driving robots and milling machines. The virtual models on screen must negotiate with the choreography of machines. The Institute for Advanced Architecture of Catalonia (IAAC) is a center for research, education, production and outreach, with the mission of envisioning the future habitat of our society and building it in the present.